No matter what your final intentions are for your concrete slab, its surface should always be very well prepped. The key to every good overlay, sealing or precast concrete project lies in good surface preparation. A concrete project will last only as long as the amount and quality of prep-work done before any finished coating has been applied. The first priority for every job involving concrete should be to strip off whatever coating was there previously, either chemically or mechanically. Once the previous coating has been removed, the slab can be cleaned and profiled. Since most concrete becomes damaged over time, you now need to check for and repair cracks and patch holes and pits in the substrate. To prevent future breakdowns in your concrete surface, dealing with the primary cause of most failed slabs – moisture – is the last step in a well-prepared surface. SureCrete manufactures products for each and every step of your project and we’ll make sure that your finished concrete surface lasts a very long time. What kind of concrete surface preparation is the best choice? When you are applying a sealer, stain, coating, or cement-based overlay to a slab of concrete, it is essential to have a surface that you can properly bond. Without proper concrete surface preparation, your next stage of application will be doomed to have adhesion failure. There are two ways to clean concrete? Mechanical and chemical. 1. Mechanical Repair of concrete surface preparation utilizes shot blasting, diamond grinding, and sanding. This process removes the cream off the surface and gets underneath the problem. 2. Chemical concrete surface preparation uses a variety of liquid solutions to remove dirt, debris, mineral deposits, mastics, glues, and sealers. In many cases, SCR™ is the best and most environmentally smart solution. This process is used when the integrity of the cement surface is sound and does not require mechanical applications. Products to clean, density and waterproof concrete surfaces to add strength and prep the surfaces for other applications. 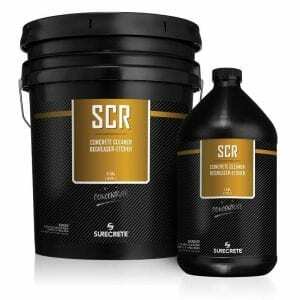 SCR is a 3-n-1 concrete cleaning solution. The detergent cleans rust, efflorescence, & stains while the mild degreaser attacks oil & gas residue. The mild acid etches & profiles. 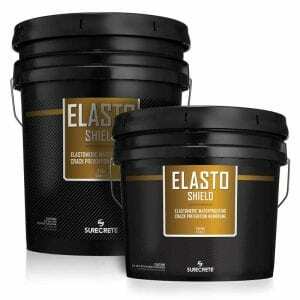 Elasto-Shield is an elastomeric waterproofing membrane used to cover concrete, wood surfaces, and shower systems. In many cases, it will act as a crack suppressant. LD 1800 is a specially formulated lithium silicate densifier that does not carry a sealer. 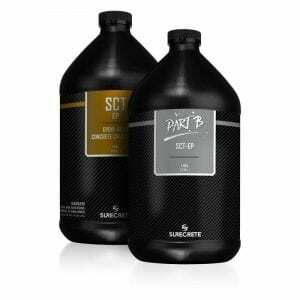 Use to increase surface strength in concrete and hibernate future spalling. What is Concrete Moisture and Cleaning? When preparing your concrete surface for stains, overlays or sealers, one of the most important tasks is dealing with the underlying cause of most slab failures – moisture. Of course, the first step to any good prep job is to make sure the surface is entirely clean and clear of any stains or adhesives. 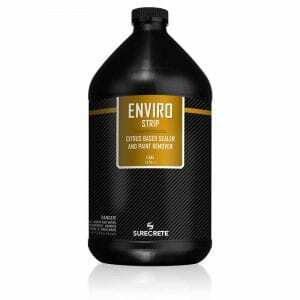 For cleaning, we provide the market leading eco-friendly products of EnviroStrip and SCR. Between these two products, there aren’t many stains or unwanted products that you won’t be able to remove cleanly. For attacking the problem of moisture migration in your concrete slab, we’ve formulated two products: ElastoShield and LD1800. LD1800 goes on like any other cleaning product, but after a few minutes of work, time will strengthen the top “cream” layer of the concrete by introducing slight glass silicate to fill in the too-small-to-see voids in your concrete. ElastoShield can be used as a complete moisture barrier product to seal any and all moisture from seeping through the concrete surface. No matter what kind of slab you’re trying to wrangle into submission, at SureCrete, we’ll make sure you can get the cleaning & moisture products needed, the moment you need them. What causes spall, pitted, and damaged concrete outside? Answer: Damaged concrete can happen for a variety of reasons. Although it is easy to blame contractor error or poor craftsmanship, this is the least likely reason for the concretes poor performance. The rise in spalled or pitted concrete has a lot to do with the change in weather patterns, specifically, freeze-thaw cycles. Over the past ten years, many parts of North America have changed from 3-5 times a year that the snow melts and then refreezes. Long lasting frozen periods do not affect concrete the way melting snow and ice and the refreezing process. In many cities, freeze-thaw cycles have tripled or quadrupled. With the increase in freeze-thaw, very little has been done to protect the concrete from ice forming inside the cement and aggregate from the melting process. When water is absorbed by melting snow and then freezes it expands by 10%. Therefore this expansion causes the top part of the concrete to pop off or spall. Deicing agents can also eat at the cement in concrete, deteriorating it and causing pits to appear as the bonding agents between the cement and aggregate disappear. To help prevent this many seals there concrete once per year with a product like HS-240. The use of a lithium densifier that does not carry a publishable sealer, like LD 1800, can help strengthen damaged concrete. 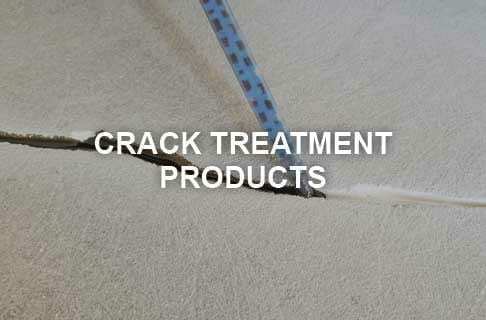 Products to treat and repair all sizes of concrete cracks prior to overlay or sealer application. SCT-22™ is a two-component fast-setting urethane injection material to fill spalls, cracks, and pits. It is 100% solids with ultra-low viscosity keeping your project on time. SCT-EP™ is a conventional static crack filler. The 2-part epoxy with the addition of sand is the most economical system. Dry time is longer than urethane treatments. What is Concrete Crack Repair and Why is it Important? Before a nice, clean overlay or coating can be applied to your concrete slab, you’ll need to treat any cracks in the substrate. While no crack can be completely “fixed”, we’ll provide you the tools you need to make sure they are repaired for years to come and don’t shadow through to your surface layer for a very long time. While some cracks may need to be “cut out” to allow the concrete surface to move and shift more freely, most can be treated with either an epoxy or urethane crack treatment product, depending on the size and depth of the void. 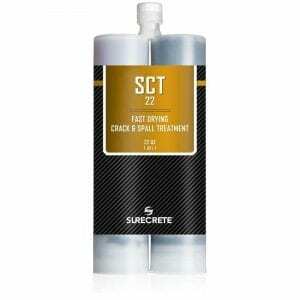 For smaller cracks, we suggest our SCT-22 Urethane crack treatment product. For larger voids, we prefer our Epoxy Crack Treatment product in conjunction with some filler product such as sand. At SureCrete we take great pride in ensuring that your concrete projects last as long as they possibly can, and to that end, we’ve specially formulated our crack repair products to last as long as your decorative overlays will. What is the purpose of concrete crack treatments? Cracks in the concrete are always an eyesore. Identifying what type of break you will determine the correct products to treat it and minimize its recurrence. In this instance, we are not talking about control joints, only cracks that happen in-between control joints. The two types of cracks are active or static. Static breaks are no longer moving. In many cases, they may be viewed as hairline cracks but can be as wide as 1/2 inch. Active cracks can start as a hairline, but continue to widen as the slab is now two pieces of concrete separating farther from each other. There are no treatments available to stop an “active” crack. The reason for this is due to the mass of each slab bearing too much on a thin material to keep it together. No longer active breaks, static, and hairline cracks can be treated in most cases. Depending on some linear feet and time to complete the process the user can use a cement, urethane, or an epoxy cracks treatment. Products to remove grease, acrylic sealers, and carpet glues, all specially formulated for each situation. Fast Strip Plus is a solvent-based stripper for heavy coatings when mechanical removal is not desired. Can be used indoors and outdoors. Enviro-Strip uses a high powered citrus solution, non-flammable, to aid in the removal of acrylic sealers regardless of interior or exterior floors. Glue Remove is a safe, non-flammable, glue remover which will soften mastics and carpet glues to make removal easier. Can be sprayed, brushed, or mopped on. 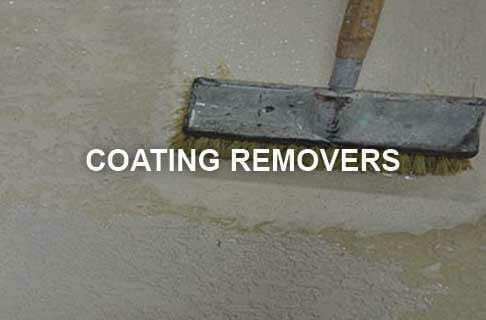 About Concrete Coating and Sealer Removers? If you want to put a pretty new coating on your concrete surface, you’ve first got to rid yourself of the old one. Coating removal is a major step in preparing your concrete to accept new stains or overlays because, without it, your new coatings will likely only last months instead of years. To make your surface removal project easier, we’ve formulated multiple products to keep your job on time and budget. Depending on the type of coating that you need to remove, you’ll select a different kind of product, but no matter which type you need, we’ve got you covered. Between EnviroStrip, GlueRemove and FastStrip Plus for those extremely hard to deal with coatings, you’ll be able to get your surface prepped and ready to accept whatever decorative stain or overlay you like. Products to repair concrete holes spalled surfaces and filling of missing or damaged concrete. Flash Patch is a cement based patching compound that can go from 1” thick to feather. 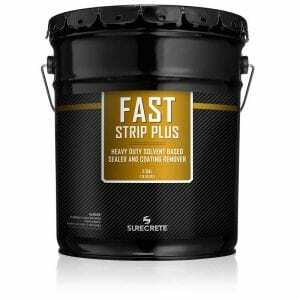 Cures in 45 minutes with a no-slump, workable patch in white & gray cement. Deep Level is designed to go from 1/8” and up to fill larger holes and chunks of missing concrete. When patching concrete from 1”- 4” addition of pea gravel is recommended. Why use Concrete Repair Materials Thin or Thick Holes and Spalling Cement? Nobody wants a concrete slab that has large pits and voids in it, no matter what their cause was. And you certainly can’t apply a beautiful new decorative overlay without filling them in first! Our concrete patching products allow you to deal with this step exceptionally efficiently and smoothly. We’ve formulated our pre-blended patching bag mixes to deal with a wide range of concrete problems. When trying to level out your slab or deal with huge holes and voids, we’ve developed our Deep Level bag mix. In conjunction with an easy-to-use bonding agent, this product can help you save a slab that you may otherwise have needed to destroy and re-pour merely. For smaller voids, our Flash Patch product can make your life very easy. 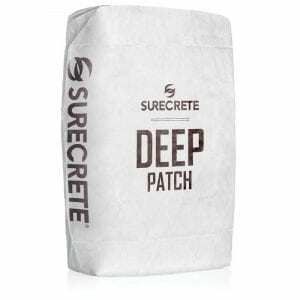 With a simple just-add-water mix design and the ability to have your patchwork fully set in as little as 45 minutes, there isn’t a better product on the market to deal with your concrete patching issues. What causes spalling to occur in concrete slabs and walkways? Whether it was the slump of the concrete, a bad mix, improper screening/floating, age, or a direct cause of de-icing agents penetrating the concrete surface, spalling concrete is an eyesore and an issue that needs attention. When you factor in labor, time and material costs, the question becomes: can you create an affordable, realistic solution for the conditions that initially caused the concrete to spall? Can the concrete restoration system also be environmentally friendly? Surecrete’s concrete restoration system provides answers to both questions. Let’s look at what products are involved and why they are recommended. Most contractors will begin with an aggressive pressure washing or be scarifying of the concrete surface. The goal of this process is to remove all loose concrete and create a sound surface. An oscillating turbo tip and a pressure washer of 3,500 psi or higher will be sufficient. Using SureCrete’s SCR will clean, mildly de-grease, etch and profile the surface preparing it for your slip-resistant thin concrete overlay. This product is environmentally friendly and will not harm plant life when rinsing the product off. A typical application is a 2-1 ratio of water to SCR. Prevention of further damage to the spalling concrete is not an exact science. A sound option for prevention is the use of a Lithium densifier. Why use Lithium Densifier? Use of Surecrete’s LD 1800 (lithium densifier) will harden and increase the surface PSI, slow moisture migration both south and north, and slow and in most cases stop efflorescence. Use of conventional sodium or potassium sodium hardeners is not recommended as they may leave a high concentration of salts deposited on the surface of the concrete and may add to new surface cracking or scaling. There are many quick patch concrete bag mixes, each varying in price. 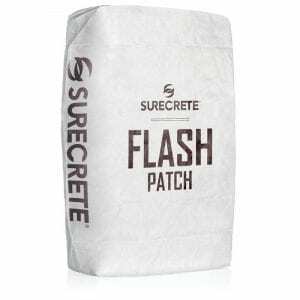 SureCrete’s Flash Patch is an ideal material choice for patching concrete or filling in damaged spalled areas. The reason for this is the fact that in many areas freeze-thaw can cause delamination of specific, concrete patch material. Flash Patch gives you the strength and speed of hydraulic cement, the work time of 15-20 minutes and a premixed bonding agent to overcome freeze-thaw bonding. Couple that with a compressive strength of 6,200 PSI, Zero VOC, and single component, there is not another bag mix that compares in quality, durability or consistency. In addition to those attributes, this material allows you to patch all areas of the spalled concrete surface. Once applied your wait time is a matter of 15-30 minutes, then you can begin using slip-resistant thin concrete overlay. Are you looking for a fresh broomed concrete surface or would you like to upgrade your concrete look and go with a decorative concrete pattern or texture? If you chose a crisp broom finish, SureBroom is the smart choice. SureBroom is a single component (just add water) mix, Zero VOC thin concrete overlay that delivers a fast cure time and a compressive strength of 6100 PSI. 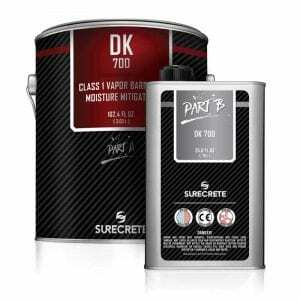 SureCrete suggests a two coat process as each coat is about 1/16th of an inch and will not completely cover over minor spalled damage. The second coat will bring the damaged spalled concrete surface back to smooth. The tools you need to apply SureBroom are metal squeegee, horsehair or nylon horsehair concrete broom, mixing paddle on drill and a 5-gallon empty pail to blend in. This system delivers simplicity of technique and a low material cost without compromising strength, quality or longevity of your new slip-resistant thin concrete overlay coating. Most contractors prefer the use of a solvent acrylic sealer. The reason for this choice is that a quality solvent acrylic sealer will provide deep penetration into the concrete and increase adhesion. If applied to the correct thickness, it will minimize the slicking off of the slip-resistant thin concrete overlay that was used to the spalled concrete surface. Which concrete sealer do you choose? We suggest a solvent acrylic sealer with 20% solids. SureSeal Pigmented or HS 260 will deliver the needed attributes and aid in repelling deicing agents and preserving the slip-resistant thin concrete overlay from spalling and other causes which deteriorate the surface. A common question after the application is how often we should reapply sealer? We would love to give a reliable timetable for 2-5 years, but the simple fact is many factors come into play that de-grease the lifespan of a sealer. How can you tell if your sealant is weakening? Try a water test. When water is applied to the surface, it should bead up as water would on a waxed surface. If the water beads your protection is still sound. If you desire to keep, the clean, shiny look of your surface reapplies a single coat of a quality 20% solid solvent acrylic sealer like SureCrete’s HS 260. Concrete copolymer products that can increase abrasion resistance and assist in the curing concrete strength as well as concrete overlay bonding. 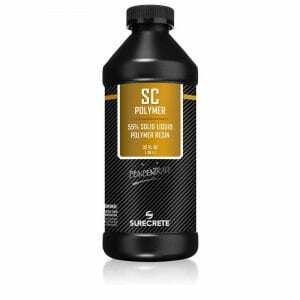 Polymer Concentrate is a 55% solids acrylic which is diluted to create a white milky liquid for dual component overlay primer and bond enhancing scratch coats. SureCrete’s SureBond is a necessary concrete bonding agent used specifically in scenarios involving the use of the SureStamp and Deep Patch thick texture products. 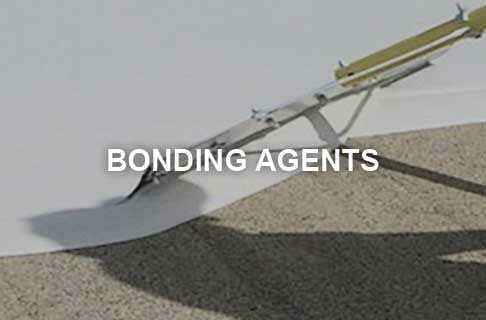 Why use Concrete Bonding Agents? Are you dealing with a concrete slab that is a bit too porous? Or maybe you need a little bit more work-time while using one of our overlay bag mixes. In either case, you’ve come to the right place. When trying to deal with an excessively porous substrate, utilizing Polymer Concentrate will help to keep your project on time, your stains looking vibrant and prevent your decorative overlays from developing shrink cracks. To keep your overlay surface workable, take advantage of our Retarder and Surface Delay products. At SureCrete, we want to make sure that your concrete project turns out just as perfect as you imagined it. To that end, we hope you’ll make good use of our retarders and adhesion products that are made readily available at any of our stocking distribution locations located conveniently throughout the country. Concrete curing agents designed to slow or delay the curing time of new and overlay concrete pours. SureCrete’s Retarder slows the setting time of concrete overlays during warmer temperatures. Any SureCrete overlay labeled “winter” can have its cure adjusted. Surface Delay is a film forming the solution that helps keep the cream finish off an overlay or freshly poured concrete surface moist in windy and hot environments.